You are using the OpenEnergyMonitor software on a Raspberry Pi? Great! You can use this smartmeter with the SmartChargingController EDL, now! Thanks to Mr. Wessel for the support! The power-data will be provided as a mulicast JSON datagram throw your local area network. The points 1 to 5 are the sender components, points 6 to 8 are the receiver components. – Install the SD card with the following documentation. – Start the Raspberry Pi. – The default password is „root“ too. – To view the output of the background running script we first need to kill it. – We are looking for the process ID of the python script (PID) in my case this is ‚1118‘. – We can now kill this process with the line, replacing xxxx with the PID of your python script process. – Since this is a read only file system we need to temporary make it read/write. – Now we can replace the oemgateway.py file, with is located on /root/oem_gateway. – You can download the new oemgateway.py here: oemgateway.py.tar to view or edit the code. This is a very simple modification! Please feel free to modify, change or improve this code. – We lock it back to read only system. – That’s all. We can restart the system. If you do not want to modify the software itself, you can download the complete, modified SD image here. You must install it on and SD card, like in these documentation. – Extract the EDL tar archiv. – Copy the files in the matching subdirectories. – We can save the ini file and start the EDL service. 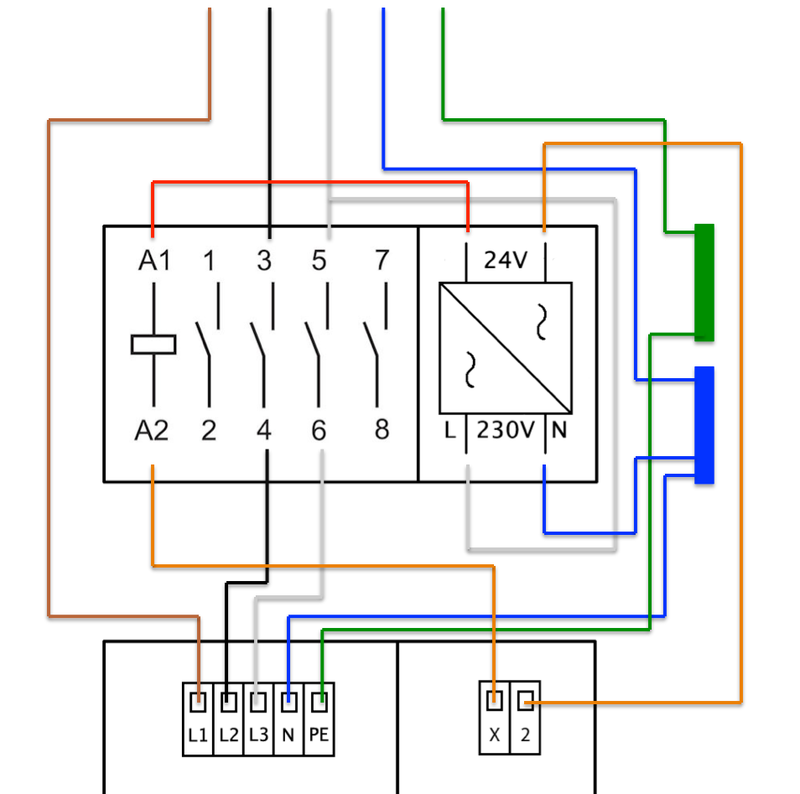 Important: If your car supports more than one phase AND you want to use the SURPLUS-Mode (surplus charging on a self-generator system) with charging power from 1380 to 22000, you must install an installation contactor before the wallbox. This installation contactor will be controlled by X2 output (KEBA) and switch the phase 2 and 3 on or off. The code is designed to get 3 power values from emonTX. (power on phase one, power on phase two and power on phase three). In this case it will be send 230V as a fixed value. If you get an addional voltage (value 4 = voltage) from emonTX, you can uncommand line 4 and remove the command maker at line 7. That’s all. Yes, this is quick and dirty, but it is runnig. Feel free and modify it into a better code.